This post was published by Middle East Institute on January 7, 2016. Following is the link to the article: http://www.mei.edu/content/map/flood-governance-jakarta-role-community-based-organizations-mitigating-annual-floods. In case of the link is not available, I copied the article as you can find below. Thank you. Batavia, the colonial capital of the Dutch East Indies in the first half of the 20th century, was a small urban area of approximately 150,000 residents. In the second half of the 20th century, Batavia became Jakarta, the capital of independent Indonesia. Today, Jakarta is a megacity of 28 million residents and is the largest and one of the most dynamic metropolitan areas in Southeast Asia; it is also beset with most of the urban problems experienced throughout the region. The increasing intensity of annual flooding is a major concern that has plagued Jakarta over the past two decades. In 2007, the worst floods in memory inundated about 70 percent of the city, killing at least 57 people and causing about 340,000 to flee their homes. Moreover, the estimated annual damage due to flooding in Jakarta is approximately USD 321 million. The fall of Indonesia’s New Order regime in 1999 spurred the process of democratization and decentralization. Flood governance is a relevant topic to decentralization efforts in Jakarta, as local governments still lack full power as well as the means to implement effective flood policy. This article discusses flood governance in Jakarta and examines the role of community-based organizations in mitigating annual floods. Jakarta’s geographic location makes it prone to flooding: the city lies in a lowland area through which 13 rivers flow; as a lowland area, high tides in the coastal area have also generated floods. All tributaries and basin areas of these rivers cross the provincial administrative regions of West Java and of Jakarta and cut across the local jurisdictional boundaries of Bogor, Tangerang, Bekasi, and Depok. Jakarta experienced severe flooding as early as 1893. All floods in Jakarta in the first half of the 20th century were due to high rainfall and the breaking of dikes and dams. In order to mitigate the floods, the Dutch colonial administration established the Department of Public Works (Departement van Burgelijke Openbare Werken) in 1918 and built the West Flood Canal in 1922. However, the flooding cycle in Jakarta changed from one flood every 3 to 5 years in the first half of the 20th century to once per year since the 1970s. Flooding has had critical impact on the infrastructure and population of Jakarta. In 2008, floods inundated most parts of Jakarta including the Sedyatmo toll road; and nearly 1,000 flights in the Soekarno-Hatta International Airport were delayed or diverted while 259 were cancelled. 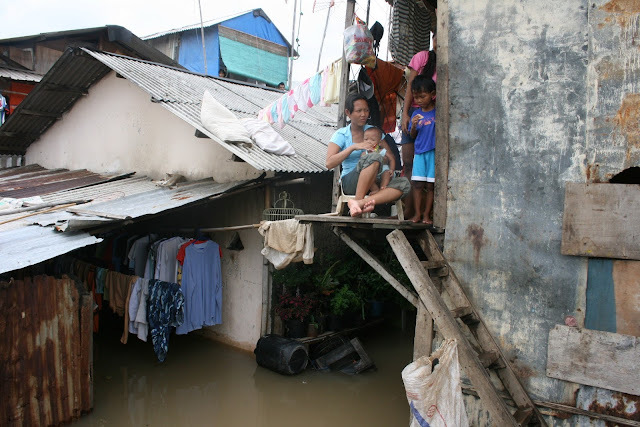 In 2012, floods submerged hundreds of homes along major Jakarta waterways, including the Ciliwung, Pesanggrahan, Angke and Krukut rivers, and displaced 2,430 people. In January 2013, many parts of Jakarta were inundated following heavy rain; and, as reported by the National Disaster Mitigation Agency (BNPB), the ensuing floods killed at least 20 people and sent at least 33,502 fleeing their homes. In the aftermath of these annual floods, the government normally attempts to dredge the rivers and release floodwater as quickly as possible into the sea via the East Flood Canal. Construction of the East Flood Canal began in the aftermath of major floods in 2002, and reached the sea on December 31, 2009 after very slow progress due to the complicated land acquisitions. The East Flood Canal has been considered the most feasible means to prevent future flooding in Jakarta, but clearly cannot prevent flooding entirely. The government also pursued implementation of flood management infrastructure such as the Jakarta Urgent Flood Mitigation Project/Jakarta Emergency Dredging Initiative (JUFMP/JEDI) and initiated a program to improve discharge and retention capacity of streams and floodplains. Yet, despite these efforts to alleviate flooding, the severity of flooding in many parts of Jakarta has not decreased. Recent flood management approaches recognize the importance of community-based coping capacities and adaptation strategies. Thus far, government responses to flooding in Jakarta have lacked public participation, particularly in land acquisition and environmental management. Despite democratization and decentralization measures that began after 1999, no inclusive government or community empowerment has been developed in Jakarta’s neighborhoods. In order to coordinate disaster management, including floods, the Government of Indonesia established the National Disaster Management Coordinating Board (Bakornas) in 1979. This national body provides central coordination with support from 13 ministries and the Armed Forces. Bakornas formulates disaster management policy including prevention, mitigation, rescue, rehabilitation, and reconstruction, and coordinates disaster management before, during, and after disaster. Interagency disaster task forces were also created at the provincial level (Satkorlak), the district level (Satlak), and the sub-district level (Satgas). The end of the New Order regime marked the transfer of various authorities and responsibilities from the central government to local governments, including provincial, districts, and municipalities. The Regional Autonomy Law 32/2004 and the fiscal Decentralization Law 33/2004 stipulated that the local governments have powers and responsibilities in all government administrative sectors except for foreign policy, security and defense, monetary and fiscal matters, and justice and religious affairs. These two laws have the potential for making urban planning and development in Indonesia more locally managed. Nevertheless, flood governance in Indonesia, particularly in Jakarta, remains a severe issue for the local governments due to lack of authority and existence of slums and squatter settlements along riverbanks. Despite the stipulations from the Regional Autonomy Law 32/2004, the local governments do not have full power to mitigate and manage floods. The central authorities still govern the largest and most flood-prone river in Jakarta, the Ciliwung River. The Ministry of Environments and Forestry maintains the responsibility for the upper watershed of the Ciliwung River, and the Ministry of Public Works has the authority to improve the river’s discharge and retention capacity. The slums and squatter settlements along Jakarta’s riverbanks also complicate flood management efforts. The residents of Jakarta’s riverbanks are the most vulnerable to flooding and the potential for flood damage. Yet, they have developed deep distrust of local politicians over the years and will not follow their safety advice or accept their material support. They also feel comfortable with and are accustomed to the flooding and will continue to use their pragmatic coping strategies. Indonesia’s democratic transformation after the fall of the New Order regime sparked the growth of social movements and non-government organizations (NGOs). Padawangi and Douglass identified several NGOs on the Ciliwung River that serve residents of Ciliwung riverbank including Ciliwung Merdeka, Telapak, Kota Kita, Yayasan Tanggul Bencana Indonesia, Plan Indonesia, Lembaga Pemberdayaan Masyarakat Jakarta, and several community initiatives such as Komunitas Ciliwung and Gerakan Ciliwung Bersih. Negotiating with riverbank residents to relocate to a safer place has been a big issue for the Jakarta city administration. The city administration has proposed the relocation of riverbank residents as a flood mitigation measure since the 1980s, but it has failed to materialize. The lack of financial support and public resistance to the evictions has been blamed as reasons of the initiative’s failure. Some NGOs have offered alternative on-site resettlement to riverbank residents who have resisted eviction. For example, Ciliwung Merdeka worked with the residents of Ciliwung riverbank and sought their input for on-site resettlement proposals and convinced skeptical residents about the benefits of multi-story housing. The residents were fearful of losing their current accommodations and livelihoods and were biased against multi-story housing. Ciliwung Merdeka held weekly meetings with the Ciliwung riverbank residents since October 2012 and discussed the plan on how to make a more habitable and secure environment. Ciliwung Merdeka also negotiated with the Jakarta city administration to obtain a waiver of spatial planning regulations that require all buildings be located at least 164 feet from the river. The Jakarta city administration approved the request and asked the settlement to move back at least 20 feet from the riverbank. The area was to build a road to allow fire trucks to pass 13 feet from the riverbank and allow a 7-foot demarcation for green space. Based on input from the residents and the advice of a group of experts, Ciliwung Merdeka presented the proposal of Kampung Susun (elevated villages) to the Jakarta city administration. In response, the Jakarta city administration asked Ciliwung Merdeka to additionally provide a health care facility, a mosque, and schools. The Jakarta city administration eventually approved the proposal of Kampung Susun on September 16, 2015, and the development project is expected to begin in 2016. Trash management poses another issue for flood mitigation efforts. While Jakarta’s resident produce 6,300 tons of garbage per day, only 5 percent of it is recycled. The immense amount of garbage that builds up along Jakarta’s riverbanks and canals causes additional flooding, and exacerbates sanitation concerns that arise during floods. This reality has encouraged NGOs to push for strengthened recycling measures. Ciliwung Merdeka also had established a Compost House to recycle organic waste from residents of three kampungs (villages) along Ciliwung riverbank including Kampung Melayu, Kampung Pulo and Bukit Duri. Squatters living in three kampungs along Ciliwung riverbank received around 10 Rupiah per every kilogram of organic trash they collected. The recycling program was also intended to raise residents’ awareness about the importance of trash management and discourage dumping in the Ciliwung River. NGOs have also played a critical role in flood response. During floods, Ciliwung Merdeka’s rescue and relief efforts have often proven to be faster than those of the government. The residents were able to maintain flood rescue and relief efforts on their own.They succeeded in moving their possessions and electronic equipment to higher ground and evacuating children and the elderly to mosques. Flood governance in Jakarta is a complicated issue, especially since it also entails dealing with the existence of slums and squatter settlements in riverbanks. The 350,000 residents of Jakarta’s riverbanks are vulnerable to floods but have low trust in the government. They are also accustomed to dumping trash into the river. The role of NGOs is very important in managing and mitigating floods in many ways: they empower and collaborate with residents in order to improve the living environment; mediate communication between the local government and residents; and also educate residents about the importance of trash management and community-led rescue efforts. An effective flood mitigation and management in Indonesia particularly in megacities such as Jakarta requires a strong community participation particularly from the riverbank residents. The residents of slums and squatter settlements in riverbanks are the players of the informal sector who play an important role in the process of urban transformation in Indonesian cities including Jakarta. Flood governance in Jakarta will not succeed without the empowerment and the participation of the riverbank residents. The government needs to work alongside NGOs to promote public participation in community-based coping capacities / adaptation strategies. Flood governance in Indonesian cities will also require a transfer responsibility of governing watersheds and rivers from the central government to the local governments. The latter need to have full power to govern the rivers in their respective areas. Despite the stipulations from the Regional Autonomy Law 32/2004, the central authorities still have full power to govern the largest and most flood-prone river in Jakarta and maintains the responsibility for the upper watershed of the Ciliwung River. The central government needs to empower the local governments in governing rivers and the watersheds. The flood occurred from the prolonged and heavy rain in a two-week period from January 28, 2007 to February 2, 2007. Liu et al. (2007). Regional frequency analysis of extreme rainfall events in Jakarta. Natural Hazards 75: 1075-1104. Y. Budiyono, J. Aerts, J., Brinkman, M.A. Marfai, and P. Ward, “Flood risk assessment for delta mega-cities: A case study of Jakarta,” Natural Hazards 75 (2015), pp. 389-413. Deden Rukmana, “The change and transformation of Indonesian spatial planning after Suharto’s New Order regime: The case of the Jakarta Metropolitan Area,”International Planning Studies 20:4 (2015), pp. 350-370. M.A. Marfai, A.B. Sekaranom, and P. Ward, “Community responses and adaptation strategies toward flood hazard in Jakarta, Indonesia,” Natural Hazards 75 (2015), pp. 1127-1144. Restu Gunawan, Gagalnya sistem kanal: Pengendalian banjir Jakarta dari masa ke masa (The failure of canal systems: The history of flood management in Jakarta) (Jakarta: Penerbit Kompas, 2010). Ien Aje, Banjir di Jakarta Tempo Doeloe (The early years of floods in Jakarta)(2013), https://www.facebook.com/notes/ien-aje/banjir-di-jakarta-tempo-doeloe/10151331859093444. Gunawan (2010) reported the floods in 1970, 1972, 1974, 1975, 1976, 1977. The flood in January 1976 sent about 29,000 fleeing their houses. The next big floods occurred in May 1980 and December 1981 that displaced 27,000 people and 200,000 people respectively. The December 1981 flood also killed 9 people (Gunawan 2010). Deden Rukmana, “The Megacity of Jakarta: Problems, challenges and planning efforts,” Indonesia Urban Studies, March 2014,http://indonesiaurbanstudies.blogspot.com/2014/03/the-megacity-of-jakarta-problems.html. Rita Padawangi and Mike Douglass, “Water, water everywhere: Toward participatory solutions to chronic urban flooding in Jakarta,” Pacific Affairs 88:3 (2015), pp. 517-550. Roanne Van Voorst, “Formal and informal flood governance in Jakarta,” Habitat International, August 23, 2015, http://dx.doi.org/10.10.1016/j.habitatint.2015.08.023. Bakornas is still in effect and has coordinated and handled emergency relief operations including earthquakes, tsunamis, floods, volcano eruptions, plane crashes, etc. Bakornas was reorganized in January 2005 after their poor coordination and management on the emergency relief operations during the tsunami and earthquake in Aceh in December 2004. Roanne Van Voorst, “Formal and informal flood governance in Jakarta,” Habitat International, August 23, 2015, http://dx.doi.org/10.10.1016/j.habitatint.2015.08.02. Deden Rukmana, “The change and transformation of Indonesian spatial planning after Suharto’s New Order regime: The case of the Jakarta Metropolitan Area,”International Planning Studies 20: 4 (2015), pp. 350-370. Tommy Firman, “In search of a governance institution model for Jakarta Metropolitan Area (JMA) under Indonesia’s New Decentralization Policy: Old problem, new challenges,” Public Administration and Development 28 (2008), pp. 1-11. Road construction in Jakarta is the responsibility of the city government. Belarminus, R. “Ahok setujui gagasan Kampung Susun dari Ciliwung Merdeka (Governor Ahok approves the idea of Kampung Susun from Ciliwung Merdeka)”.The Daily Kompas, September 26, 2015,http://megapolitan.kompas.com/read/2015/09/26/21295451/Ahok.Setujui.Gagasan.Kampung.Susun.dari.Ciliwung.Merdeka. This blog is to stimulate discussion on any urban problem in Indonesia. I call for any post and comment to make this blog moving forward and worth reading. Jakarta's city planning: What can we do and what can we expect? Do street vendors deserve urban space?